It seems so rare lately that Mr. T and I actually have a weekend to ourselves with nothing to do. Something almost always comes up- work, visitors, intense sports watching! But this Saturday we had none of that and instead had a great day just walking around and enjoying our city. We started the day off by walking up to the newly opened Ace Hotel for some Stumptown Coffee. Walking into the shop I noticed all of the barista’s had handle bar moustaches and a speakeasy style of dress. What’s up with this trend lately? It was kind of neat at first but now I see it everywhere! Anyway- onto the coffee. 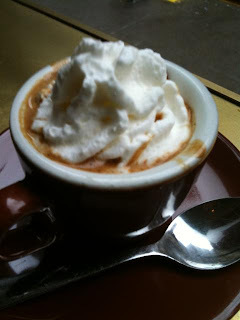 I was feeling like a little sugar boost this morning so I ordered the Espresso Con Panna. For those of you that don’t know Espresso Con Panna is just an espresso with whipped cream on top. Stumptown’s beans taste quite strong and bitter, so the sugary whipped cream was a welcome addition to my morning beverage. Mr. T began his day with a frothy cappuccino. 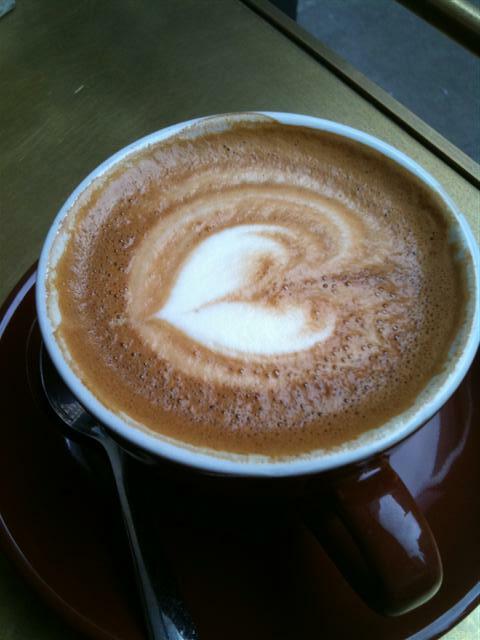 Look at the wonderful coffee art on top. Stumptown really knows what they’re doing with a sleek stylish space and some addictively great coffee. After our caffeine fix we decided to keep walking uptown. Suddenly we found ourselves in Times Square right when it started to drizzle a little bit. Trying to avoid the rain we dashed inside ESPN Zone and spent a good half hour shooting some hoops and playing some car games in their over the top arcade. The rain appeared to have let up so we ventured outside once again. However just 5 minutes later the skies opened up again and we were forced to find shelter in the nearby bar Jimmy’s Corner. Jimmy’s Corner is probably one of the least known, certainly least touristy bars in all of Times Square. I absolutely love its divey atmosphere, cheap drinks and fantastic juke box selections. There is nothing better than watching the rain fall outside while sipping beer and listening to some jazz at a cozy warm bar. I truly could have stayed at Jimmy’s all night but hunger struck Mr. T so we headed over to Ruby Foo’s for a dim sum appetizer. People always knock Ruby Foo’s because it’s in the shitsdom that is Times Square but the food is actually quite tasty. 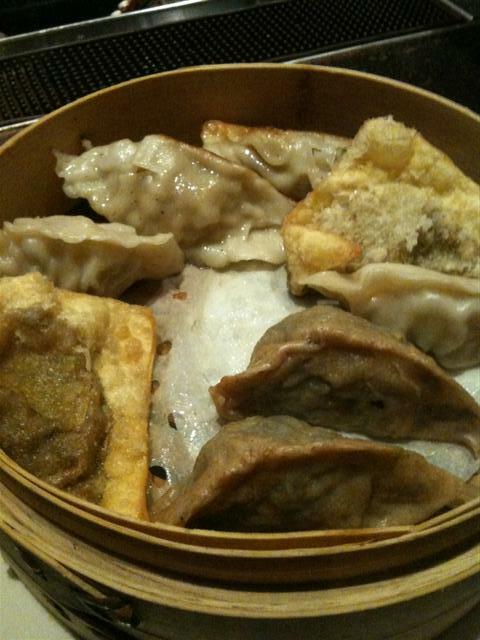 Today we ordered the Ruby’s Dim Sum Sampler. We got two pieces of Shrimp Dumpling, Vegetable Dumpling, Crispy Mongolian Beef Wonton and Sweet and Sour Chicken Pot Sticker. All of these dumplings were great, the standout being the Sweet and Sour Chicken Potsticker. 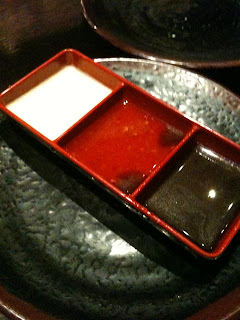 Plus they came with a tray of three dipping sauces. Who doesn’t love some sauces for dipping! The cocktails were pretty good as well. 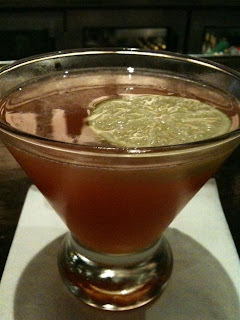 Although at $12 a pop I expect the cocktails to be pretty damn tasty. So for some cheaper cocktails after dinner we ended up at the Russian Vodka Room where they were celebrating happy hour. 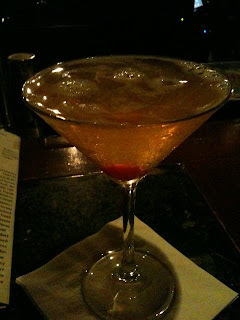 This amazingly delicious Peach Cosmo was all alcohol and only $4.00 to beat! Mr. T enjoyed some shots of their house infused cranberry vodka and we finished out the night on a wonderful note. It was nice getting out of our usual downtown rut for a night. There are so many great places in this city it’s a shame that we sometimes cut the touristy spots out all together. Mr. T and I are going to get better at exploring all neighborhoods and really trying new things. Let’s call it the start of my New Year’s resolutions!